Custom made watches expresses your life style and individuality. In the early part of the last century the pocket watch was in fashion. This century the wristwatch has been more popular. The watch is very much an accessory and compliments other jewelry like rings and cufflinks. Military watches have an important place in the history of timekeeping. Exclusive production military use began in late 1800’s. By the early 1900’s, the armies and navies started using them for precise timekeeping. The fact that distinguishes these watches from the normal men’s wristwatches is that they allow the soldier to synchronize the attacks with precision. The British army made extensive use of the early military watches during Boer wars. With time, the watch became popular among the soldiers and also the general public. Therefore, the watchmakers responded to the new trend with many brands getting a start by manufacturing small timepieces. A military watch is designed to provide precision, reliable functionality and high resilience in any environment. In modern times, the watchmakers use modern enhancements to increase the durability in the harshest environments. They are made to provide resistance to water and provides multiple time zone functionality. Various other watch styling developed for military uses have become commonplace. 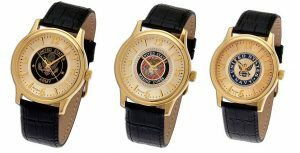 The classic round cases with black dials provided with the facility to glow with for night time viewing. American watchmakers began making watches under strict order, by the commencement of World War ll. Watches were manufactured under a codified set of specifications called Mil-Spec. These are known for their robustness and legibility. By the end of the war, they were modernized to survive the extreme temperatures, magnetism, water and shocks. The Army and Marine Corp were innovated mainly in America, where Elgin, Waltham and Hamilton emerged as the best producers of military watches. US Marine Corps have made watches, handcrafted in exclusive designs with dials and sub-dials, many new features like precision quartz movement and compass. The mascot of US Marine corps is embossed to make it look impressive.